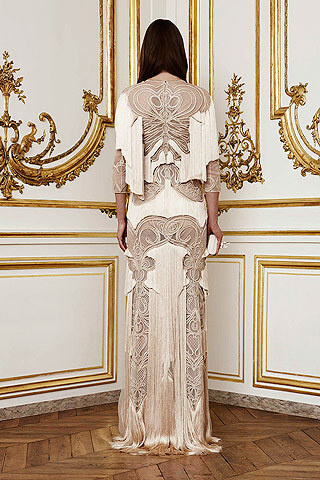 There is a new mood in the making and Riccardo Tisci of Givenchy beautifully displayed this new skeletal inspiration with the Couture collection he showed this week in Paris. Inspired by Frida Kahlo and her obsession with death, skeletons and her spinal cord problems, Riccardo designed white Chantilly lace and double silk duchesse satin gowns he viewed as “a romantic way to see death”. The intricately ornamented dresses were shown in white and gold and had all of his signatures: dégradé, lace, and fringe-work. 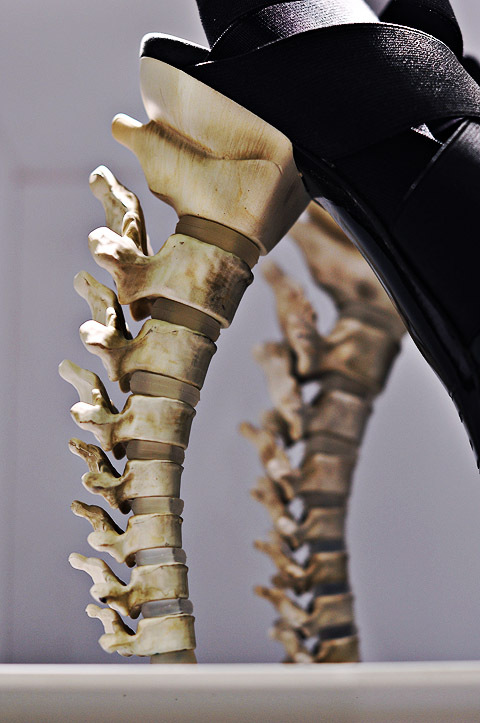 The dominant theme was the human anatomy with column dresses appliqued in crystals and pearls to mock the frame of the skeleton, zipper pulls were made of little bones, and a porcelain belt mimicked a spinal column. 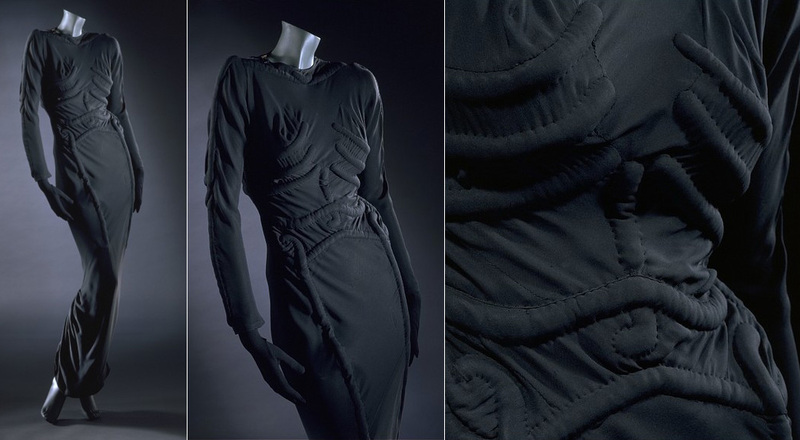 In her first collaboration with Surrealist painter Salvador Dali, Elsa Schiaparelli created a black crepe dress with padding underneath that was inspired by the human body. 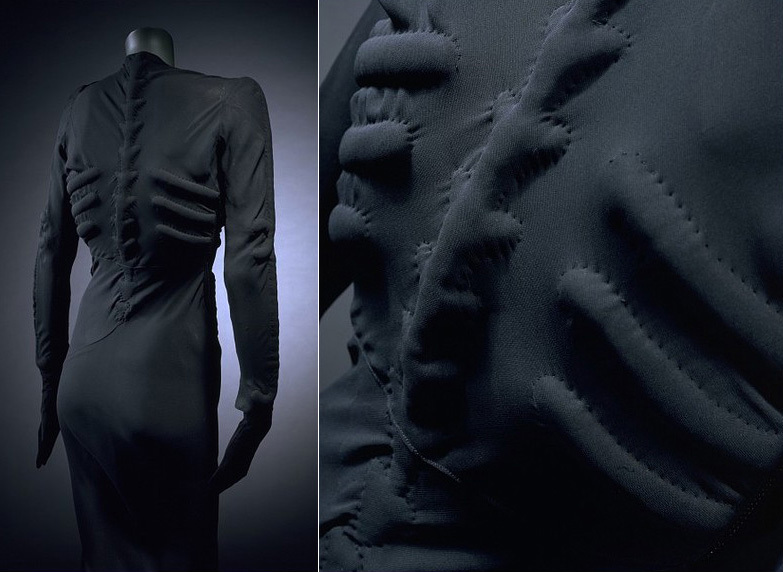 Designer’s have been referencing the human anatomy for years, starting with Elsa Schiaparelli’s Skeleton dress she created in her Circus collection of 1938. 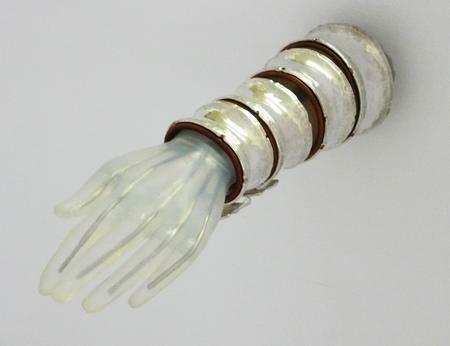 Jewelry designer Shaun Leane created his Vertebrae wrist cuff for Showstudio’s Inside/Out exhibition shop. The cuff resembles the skeletal format making four separate vertebrae made of silver and lined in leather. The skeleton motif has been popping up the past several seasons by many designers including Alexander McQueen, Christian Lacroix and Rodarte. Leggings can currently be bought on Polyvore’s ecommerce site here for $546. 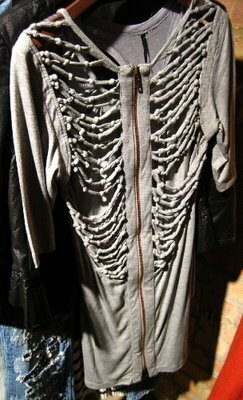 Even tshirt companies are channeling the spine using knots and slashing to look like bones. 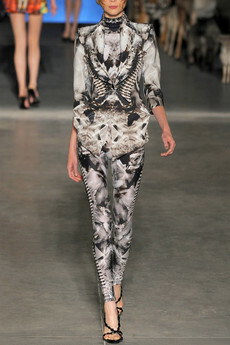 Look for more skeleton references to come as this trend begins to emerge. What brand does that skele-sweater belong to? The last picture? I’m intersted in getting one! just try to follow the instructions.